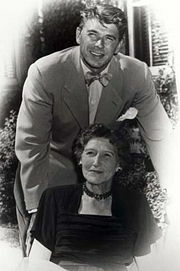 Nelle Clyde Wilson Reagan (July 24, 1883 – July 25, 1962) was the mother of United States President Ronald Reagan and his older brother Neil "Moon" Reagan. Nelle was of Scots-English ancestry. She met Jack Reagan in a farming town on the prairie of Illinois. The two were married in Fulton in November 1904. They had two children: Neil and Ronald Reagan. After the birth of her second son, Nelle was told not to have any more children. The Reagan family moved from Tampico to Chicago and many small towns in Illinois. Where they lived depended on where Jack was working. Nelle died from complications of Alzheimer's disease. She died on July 25, 1962, aged 79. Her son, Ronald, would die of the same disease. ↑ Reitwiesner, William Addams and Michael J. Wood. "The Ancestors of Ronald Reagan". Retrieved 2008-04-16. Angelo, Bonnie (2001). First Mothers:The Women who Shaped the Presidents. New York: HarperCollins Publishers, Inc. ISBN 0-06-093711-4. This page was last changed on 8 February 2014, at 00:31.